Recently I wrote a post arguing to make the definition of a startup include more than what Silicon Valley, fueled by Venture Capital return profiles, like to attach the word to. Today I’d like to talk about what startup communities outside of Silicon Valley look like, how they emerge and what makes them take hold. 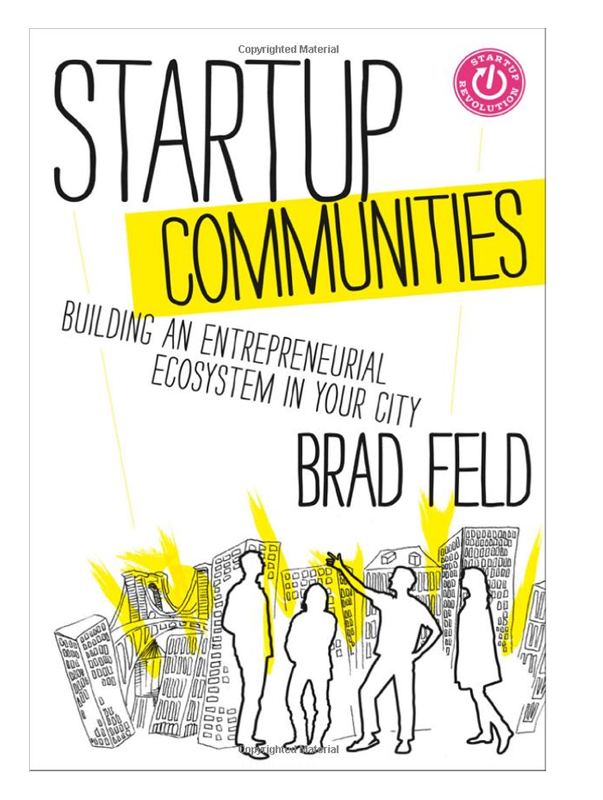 Most of what I think about startup communities came from mentorship by Brad Feld through hours of private discussion and debate. Put simply, if you care about building a successful tech community outside Silicon Valley you should read this book. I will be ordering several copies for leaders in LA and will be helping to host Brad’s visit to our community later this year. My views, influenced by watching Brad’s tireless efforts across the country, were first encapsulated in a post I wrote about Seattle titled, “A Few Key People Can Make a Huge Difference.” In that post I talked about how a few key people in any community can have an enormous impact on the fledgling success of the city or company. Think Fred Wilson, Tony Hsieh or Brad Feld. 1. A Strong Pool of Tech Founders – Stating the obvious. Duh. But I would point out that these days there are really talented tech developers and teams everywhere. And I really mean everywhere. Ever play Zynga’s “Words with Friends” or any of their “with Friends” games? Didn’t come out of the SF facility. It came from an amazing small startup in McKinney, Texas (30 miles North of Dallas) called NewToy, which they acquired. Think the next big startup can’t come from Dallas? Think again. Angry Birds? From startup Rovio in Finland. Think USV is only invested around Union Square in NYC? How about in the last 12 months deals were announced with Dwolla (Iowa) and Pollenware (Kansas City). I met the Pollenware team myself – they were KILLER. 2. Local Capital – I do believe that you’ll struggle to get a community started without some local capital. And in many communities new to building tech startups I’ve found that a lot of angel money is not very sophisticated at investing in startup companies. So you see long, drawn-out processes, non-commercial terms, investors who want to meddle too much and so on. I’ve had this conversation with several communities such as in San Diego where I believe there are way more qualified and talented engineers than local capital available to support them. And if aspiring investment teams are looking to get together the SBIC has come back with a new VC focused program to help non-Silicon Valley communities fund companies beyond their initial angel money. It’s a very smartly designed debenture program. There are two reasons you need local capital. First, it is unlikely that a serious investor will commit to funding a company outside of their geographic sphere until you have a degree of success, traction, scale – whatever. So usually the first money comes locally. When you’re Dwolla, anybody will travel to see you. The second reason for local capital (this time in the form of venture capital) is that without it every company that starts scaling will have to talk to Silicon Valley VCs who – I promise you – will tell the company that they have to relocate to the Bay Area in order to be funded. If you’re super hot / successful you can resist. Otherwise, good luck! And not that I blame them. If you’re working with early-stage companies you need to be spending quality time with them, which means you need to be nearby. And with thousands in your backyard, why would you go to far flung places to find deals? 3. Killer Events – Think about what a wonderful benefit Austin gets by hosting SxSW every year. Once per year we all have a reason to be in Austin so you’re naturally going to want to get to know the local tech scene, lowering the barrier to people wanting to move there, invest there and spend time there. I’ve seen it work in Boulder with DeFrag and Gluecon. LA has the annual Monty Conference. NY has a million including the obvious ones like AdWeek. Or how about the best example – Loic Le Meur gets everybody over to Paris every year for Le Web. Think about how amazing Big Omaha has been in attracting world-class tech people to that city. Call their organizers – find out how they did it! It’s improbable to build the next SxSW in your city. But why not start with a niche event on a topic that can attract 200 people. And build from there. 4. Access to Great Universities – It’s hard to imagine building either a tech community or a startup community without access to great universities. For starters, as Josh Kopelman outlined in this excellent post on their Dorm Room Fund, many great innovations including Microsoft, Google & Facebook started in a dorm room. Students are great source of ideas because they’re willing to challenge the existing norms – the basis for all disruption. And students have the latest tech skills and a whole lot more time on their hand to focus on building stuff. But beyond the idea that startups come from colleges, they are obviously a very important feeder system into local startups with cheap, young, hard-working talent. The key is to be able to keep the best ones local. Eric Paley, managing partner at Founder Collective, told me that they had implemented a city-wide program in Boston to help local university students get internships at local tech startups. The theory being that if a startup knew some awesome local tech startups they were more likely to join after college than assuming they had to trek to Palo Alto / Mountain View to try and work at Facebook or Google. I thought it was an amazing idea. So much so that when a friend of my family was looking for an internship at a local Boston company I contacted my friend Jeff Bussgang at Flybridge who hooked him up with interviews and he stayed in Boston rather than working in financial services in NYC for the summer. There’s a much higher probability this kid will stay in Boston now. And then obviously you want to help recruit professors to be company advisors or advisors to local investment groups. They become the best source for spotting great talent before others do. 5. Motivated “Champions” – You need brand ambassadors for your city. You need the people who “spread the word” and who arm-twist others to visit. You need the people who make sure that when great people come their visit is impeccable. In Seattle people like Dave Schappell actively recruit people like me to visit the city and when we do he becomes a “brand ambassador” for the city organizing great meetings, events & dinners. And ensuring we leave with a positive impression. Or great bloggers who spread the word far and wide like Rand Fishkin who you must read here. Joshua Baer & Jason Cohen do this in Austin, Texas. And of course Foundry Group is the original masters of this with perfectly organized ambassador trips to Boulder. More important they’ve helped support “must attend” events in town like Gluecon & Defrag that create reasons for people to continue to visit. And they helped David Cohen launch TechStars, which started as a Boulder-based accelerator. I also learned about this amazing resource in Chicago called BuiltInChicago which I intend to use for my trip there in November. Every city should have a “BuildIn” program. 6. Local Press / Websites / Organizational Tools – New York has an amazing startup scene and the energy and momentum is palpable. It also has a built-in advantage in telling the world how awesome it’s doing – it’s the center of the media world. And so you have great local tech press like Business Insider who covers the industry very well. It’s not that BI reports on NYC, but when your journalists know lots of people and tend to see more NYC people than others they’re naturally going to have their ears bent on this “company that they invested in that is crushing it!” that is right around the corner. Seattle has GeekWire, LA has SoCalTech and so on. Local press matters. 7. Alumni Outreach – I always tell communities to find out who their famous city alumni are and seek them out. Why? Well if you’re in Detroit you’re 100x more likely to get somebody who grew up in Flint coming by twice per year for ordinary reasons unrelated to work. And so it’s much easier to catch them on the bookends of these trips to spend time in your community. And aside from the obvious pride of getting involved with your home town, you obviously know a lot more about the local strengths of human resources that places like San Francisco, NY or LA might be quicker to dismiss. 8. Wins – At the end of the day, no amount of “planning” can build a community that is seen as a success – it can just be a contributor. You will not arrive until you’re seen as having local success stories. I know that there’s a lot of Groupon bashing still in the press, but you can’t deny the kick start it’s had on the local Chicago tech community. Or the huge dividends that Santa Barbara got from building GoToMeeting that sold for a nice price to Citrix. That plus CallWave spawned companies such as RightScale, AppFolio and RingRevenue – all large, venture-backed companies now. Nothing speaks as loudly as wins. 9. Recycled Capital – Fred Wilson once wrote about “recycled capital” and it’s a powerful concept. From the local wins you get pools of money from tech entrepreneurs and investors eager to reinvest it back into the community – the most likely source of a return on their capital. In Los Angeles the wins of Overture, Applied Semantics, Myspace, LowerMyBills, PriceGrabber, LegalZoom and the like have produced a large number of angels who are helping the next generation of LA entrepreneurs get started and succeed. And they have a vested interest in this success. It’s why LA is such a larger, more vibrant startup community now than it was 10 years ago. Recycled Capital has played a very important role. 10. Second-Time Entrepreneurs – The other byproduct of “wins” is you have second-time entrepreneurs who want to be founders of their next company. For every Overture or Myspace in LA you had the next tier of management who made a little bit of money and are now looking to build something massive. And they have much more experience to do it. Combine recycled capital with second-time entrepreneurs with local venture capital and you have the ignition to spark something big as we’re seeing in Los Angeles. Machinima. Zefr. Maker Studios. ZestCash. GaiKai. Savings.com. Factual. TextPlus. Burstly. BeachMint. NastyGal. There is much magic going on in this town with both pure tech as well as media tech. 11. Ability To Attract a Pool of Engineers – We know that SF is Mecca for software engineers. But we also know that it’s incredibly expensive to live there, hard to get on the property ladder, harder to stand out, etc. These problems obviously exist in any major city. What can you do to attract high-quality engineers who want something more? What innovative programs can you put in place to get them there in the first place? TechStars was a great method. What about if you could pool enough money together from local tech companies to provide free or cheap housing for engineers for their first year in town? Would more come? What about if you went even more ambitious and build an entire infrastructure like Tony Hsieh is doing in Las Vegas. That is awe inspiring. 12. Tent-pole Local Tech Companies – Seattle has them – Amazon & Microsoft. San Diego has Qualcomm. Austin has Dell. San Antonio has RackSpace. A local tech winner really creates a generational technology opportunity in the way nothing else can. It creates a feeder system of local businesses that get their first biz dev deals or sales contracts. It creates recycled capital + 2nd-time entrepreneurs … on steroids. When I look at the one thing I’m still waiting to see in Los Angeles – it’s the tent-pole company that lifts up all else. That IPOs and then continues rising. That has a B on the front. I’m willing to bet it’s coming in the next decade. I can feel it. Until then … we’ll keep plugging away. Oh, and buy Brad’s book. You won’t be sorry you did.